Yuan-ti priests are often revered like gods by their fellow inferior cultists. The greatest of them are buried in magnificent underground complexes where they, and the serpent gods can be worshipped. This is one of those tomb-temples. Only this was abandoned and forgotten long ago. In the past year, Morrok, an orc chieftain, found the underground complex and claimed it as his own. The orcs have plundered most of the temple and now use it as their home. 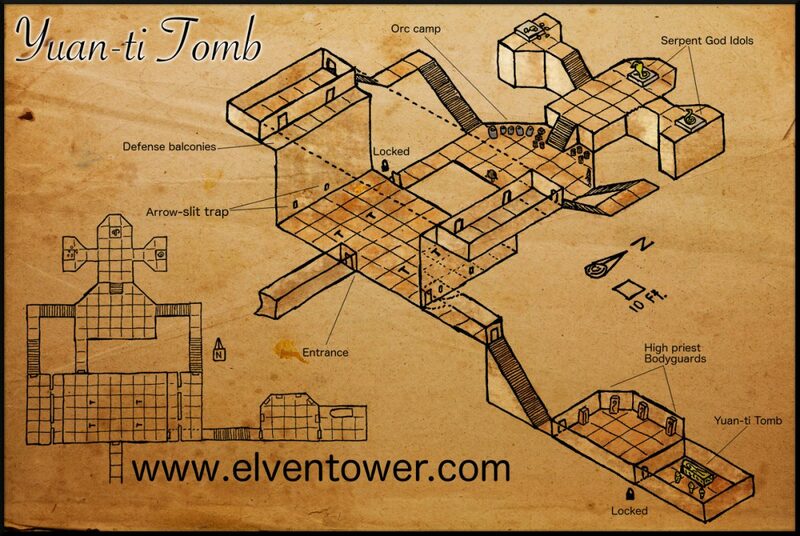 The only place still unexplored are the tombs below. The orcs tried to clear them but the undead guards are too strong. Fortunately they discovered that the guards do not pursue them outside the tombs. Since then, Morrok and his orcs just avoid that area. The influence of the serpent idols in the main chamber has given Morrok some strange dreams, and little by little, he has learned to control some divine magic that comes from the serpent idols. Morrok has access to magic like a regular priest. The first chamber in the temple serves as a defense mechanism, there are four step-plates that activate arrow slit traps (as defined in the DMG). The orcs have learned how to reload them and set them. Also, at any time 1d6 orcs are present in the balconies, ready to shoot at intruders. The two doors that exit the entrance chamber are locked, but can be opened with a Thieves’ tools check (DC 16) or a Strength check (DC 20). In the tombs, the first chamber has six sarcophagi of the high priest’s bodyguards. DM is free to use the stats of different creatures depending on the party level, they could be ghouls, wights, specters, wraiths, or a mix of them. The main tomb has never been opened. The sarcophagus’ lid has an exploding runes trap that activates if the lid is removed. Apart from that, the high priest will defend his resting place. He could well be a mummy lord, a lich or something just as challenging. If the party cannot face such a foe, then they should consider running. Two maps are included, one with tags and area names, for DM reference. Another without them for player use. You can find this map in High Resolution PDF with and without tag names, in my patreon account. My mapping ventures are funded through Patreon, It is thanks to people who like my work that I am able to continue mapping and providing RPG original experiences to people all over the world. If you like what I do, consider getting involved and backing me. What you get is impressive hi-def versions of my maps to be used in your RPG games (these have lower resolution), and the satisfaction of helping the rpg community grow bigger and stronger. Help me get funding and enjoy hi resolution PDF version of my work.